Cen-Cal Pro is holding an exclusive raffle, giving away a signed Icons of Wrestling Convention poster, autographed by a number of legendary pro wrestlers. This poster is framed and includes a certificate of authenticity verified by The Control Center Shop. 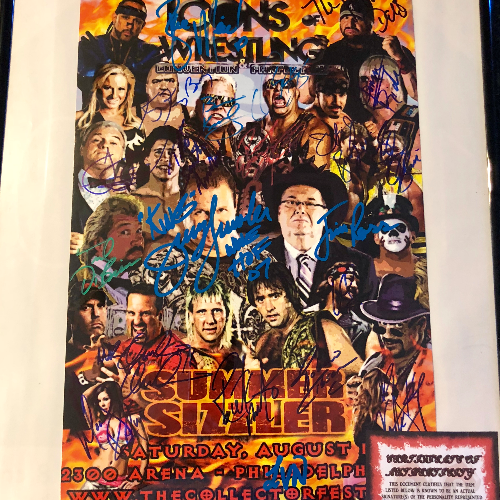 This very limited edition poster is signed by King Kong Bundy, Tito Santana, Jim Ross, "The King" Jerry Lawler, "The Million Dollar Man" Ted DiBiase, Road Warrior Animal, The Nasty Boys, Mr. Anderson, The Rock n Roll Express, Madison Rayne, Velvet Sky, and more! Tickets to enter this raffle cost $5 each, or 5 tickets for $20. ONLY 50 TICKETS WILL BE SOLD! Tickets bought online will be mailed to you upon purchase. Tickets can also be purchased at any Cen-Cal Pro Wrestling or Planet Lucha show while supplies last. The raffle will take place on January 1st, 2019 or at the Cen-Cal Pro or Planet Lucha show immediately following the sale of the 50th ticket, whichever comes first; and will be broadcast live on Cen-Cal Pro's Facebook page. The winner need not be present, as we will have your contact information to inform you that you have won. Buy tickets now, for a chance to get your hands on this awesome piece of wrestling history!